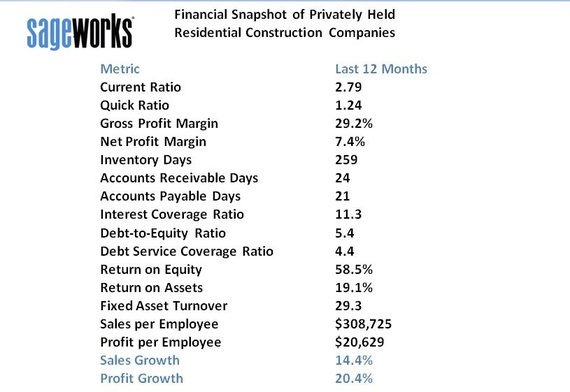 Weather may have kept homebuilders and remodelers off the job site recently, but data from Sageworks, a financial information company, show that privately held residential construction companies at least entered the year with stronger financial fundamentals than in recent years. 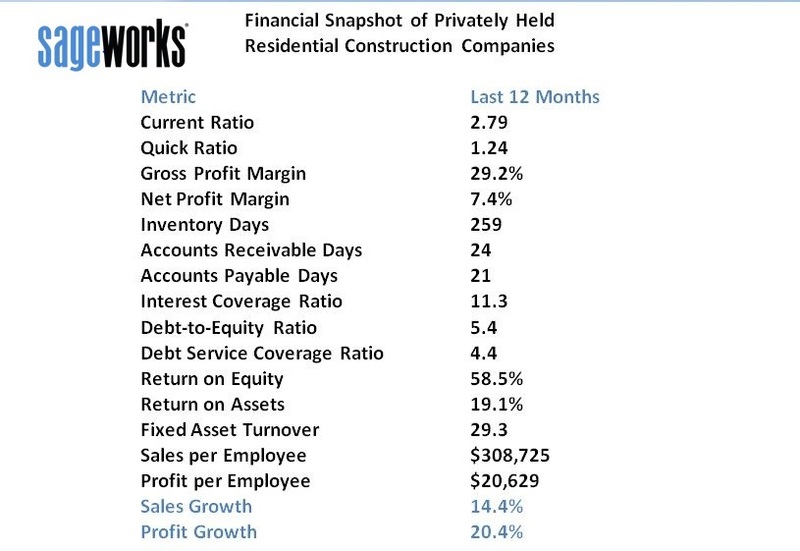 Private residential construction companies, on average, had healthy liquidity ratios in 2013, and they were in a better position to service their existing debt , according to Sageworks' preliminary analysis of financial statements for the 12 months ended January. Sales growth, too, remained healthy in that period. Debt-service coverage ratio, which shows a firm's ongoing ability to repay both principal and interest on loans, was 4.39, on average - the highest since 2006, according to Sageworks' data. Debt-service coverage ratio is one of the most basic measures of a company's creditworthiness and is considered a very important factor to lenders. Quick and current ratios were also healthy. "The improvements in the industry may not be staggering, but they are certainly positive," said Sageworks analyst Libby Bierman. "Residential construction is an industry that directly affects so many workers and so many other industries, whether it's wholesale or home accessories, that the industry's good financial performance is good news for a lot of people." The majority of U.S. construction companies are privately held, so their performance is critical to the overall industry and the economy. Sageworks' review of financial metrics was for NAICS code 2361, a category that includes general contractors, builders and design-build firms for both single-family and multi-family buildings, so it covers new construction as well as remodeling for a wide range of housing. This sector was among the first to face sales declines and faced the steepest drops during 2008 and 2009, but it has regained some momentum in the last two years as the housing market and economy have improved. In the last 12 months, sales for residential construction companies increased about 14 percent, on average, which is close to the 15 percent growth of 2012 and up from 2 percent growth averaged over the last five years. In addition, profitability continued to strengthen from the last couple of years, according to Sageworks' data. Residential construction companies, on average, had a robust 7.4 percent net profit margin for the 12-month period, up from 3.6 percent margins in 2012. Net margins for privately held residential construction companies hovered around breakeven, on average, between 2008 and 2011. Through its cooperative data model, Sageworks collects financial statements for private companies from accounting firms, banks and credit unions, and aggregates the data at an approximate rate of 1,000 statements a day. Net profit margin has been adjusted to exclude taxes and include owner compensation in excess of their market-rate salaries. These adjustments are commonly made to private company financials in order to provide a more accurate picture of the companies' operational performance.